→Can Dogs Eat Pomegranate? It Is Good, But Is It Good For Your Pup? 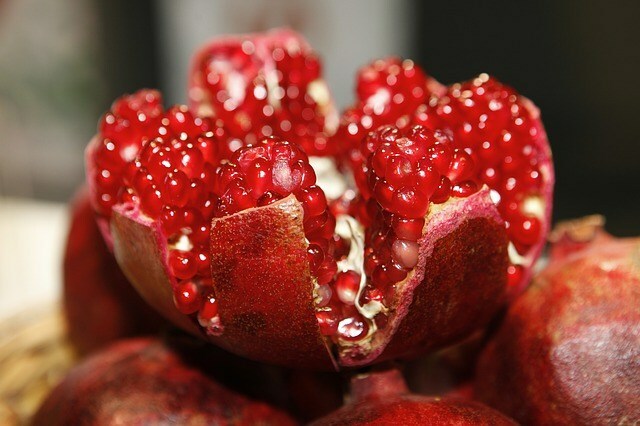 The question for today’s article – can dogs eat pomegranate? Or is it best to avoid it like some other fruit?! If your dog has eaten pomegranate, he or she should be all right, no need to rush to the nearest veterinary emergency unit. However, that doesn’t mean it’s recommended that you feed your dog large quantities of the fruit. In fact, most experts recommend not feeding your dog pomegranate at all. It is believed that due to the high quantity of tannins in pomegranates and / or the high acidity level of pomegranates, it has a tendency to upset your pooch’s stomach. Symptoms from eating pomegranate may include stomach ache, diarrhoea (diarrhea for our readers from the United States of America), vomiting shaking and shivering. If your dog has eaten pomegranate and starts vomiting, there is no need to panic, just keep an eye on your dog and make sure he / she has access to plenty of clean drinking water. In this instance, vomiting is good thing because it helps the dog’s body get rid of the pomegranate it just ate. However, if vomiting persists, your dog becomes dehydrated and / or loses its appetite, you should ring up your vet asap. Another concern with pomegranates, is the fact that your dog may struggle to digest the seeds. Dogs ordinarily won’t spit the seeds out and, due to dogs’ dental anatomy, they are also unlikely to crush the seeds before swallowing. Ingesting too many seeds can cause diarrhoea, as a dog’s intestines are not able to cope with breaking down the seeds. You will likely notice the whole (undigested) seeds in your dog’s poop. If you have a pomegranate tree in your garden, it is recommended that you should take care to keep the fruit out of Buddy’s reach. If Buddy comes across the pomegranate tree when left alone in the garden, his doggy senses will probably tell him that those fruit are yummy and he will try and eat some. Some people on pet forums aver that they have been feeding their dogs pomegranates for a long time and their dogs are old and healthy with no ill effects from the fruit. But then again, there are people that smoke and live to be over a hundred years old. That doesn’t mean that the experts will stop telling everyone smoking is bad for your health. The same goes for pomegranate and dogs. But There Are Pomegranate Based Treats? Pomegranates are packed with anti-oxidants, fibre, folic acid, potassium and vitamin C. This makes pomegranates very healthy, not only for humans but for dogs too. As already mentioned, pomegranates aren’t really good for dogs, due to their high content of antioxidants (tannins). Therefore, pomegranate in dog treats are processed into a healthier and less toxic form that is safe for dogs whilst retaining the good nutritional qualities of the fruit. These treats still have some anti-oxidants in them as well as the other good qualities of pomegranate, without the risks. Research shows that the right amount of anti-oxidants are good for dogs. In fact, many pet food manufacturers add anti-oxidants to their products. Whilst on the topic of fruit seed, many of the seeded fruits, (pears, apples, grapes) the seeds contain a small amount of cyanide. As we all should know, cyanide is rather toxic, both for humans and to dogs. Even a tiny dose of this poison will result in complications in canines. Fortunately, pomegranate seeds do not contain any cyanide. What if you have access to plenty of pomegranates (for example, you have a pomegranate tree in your garden)? Isn’t there some way you can harness the goodness of the fruit without the harmful side-effects or incurring the costs for special treats? Some veterinary experts suggest that you can give your dog pomegranate seed, in small quantities (relative to the dog’s size). To do this, remove the fruit’s flesh, then crush up the seeds in your dog’s bowl or mixed with food (see here for more info). What About Other Fruit and Vegetables? The latest research shows that, based on their intestinal characteristics, dogs lean more to being carnivores than omnivores. However, dogs have specially adapted to eating grains and some vegetation. Therefore, it is perfectly safe to feed your dog some dog friendly fruit and vegetables. One of the key benefits of plants is that they contain much needed fibre. If you see Buddy eating grass regularly it may be because Buddy needs more fibre in his diet. Grating up some carrots in with your dog’s pellets is one easy way to enhance the fibre content of your dog’s diet, particularly if your dog is already on a special diet that doesn’t provide a high fibre content. Although the concept of giving fruit and vegetables may be foreign to people who only feed their dogs pellets, dog owners who have their dogs on a “raw diet” will probably be familiar with adding fruit and veg to the canine diet (read more about raw diets for dogs here). Many owners maintain that their dogs appear to be in great health on a raw diet that contains small quantities of fruit and vegetables. If you like to give your dog treats but your dog is overweight, a small slice of fruit or vegetable could also serve as a good alternative low calorie treat. However, there are lots of dogs that will rather say “no thank you” to a slice of carrot or apple. That is perfectly normal, not all dogs like vegetation as food. Plants considered suitable to give to dogs include: Bananas, berries (such as blueberries and cranberries), carrots, pumpkin, sweat potato, watermelon and zucchinis. Plants to avoid, include: Avocados, all citrus fruit, cherries, coconut, garlic, grapes (including , raisins, and currants and their juices; grapes have an unknown toxic mechanism that adversely affects the kidneys of some dogs and cats), some nuts such as pecan, macadamias and wallnuts (peanuts are fine though and often used as a treat, but then again, peanuts are not nuts as the name suggests, they are actually legumes), rhubarb, starchy foods such as corn, potatoes and unions (see here for some more info – see rule #6). This is not an exhaustive list, for more detail on what plants you can and cannot give your dog, visit trupanion.com. Also remember to wash the fruit or veggies and remove husks, inedible skins and seeds before feeding them to your dog. A final reminder, although fruit and vegetables are a good way to ensure a nutritionally balanced diet, they should be given in moderation, even if considered safe. Buddy is after all still a carnivore. So….Can Dogs Eat Pomegranate or What? Okay, so what is the final answer…can dogs eat pomegranate or not? The short of it, while they probably shouldn’t eat pomegranate it won’t be the end of the world if your pup accidently ingests a little pomegranate. If you are keen on feeding your little fur-baby some healthy fruit and vegetables, there are some other alternatives that you can give it.